While we created this breakfast tart for a Fathers Day treat, it really is the perfect breakfast tart for anytime when in need of something special; it also makes for a great lunch served with a salad. 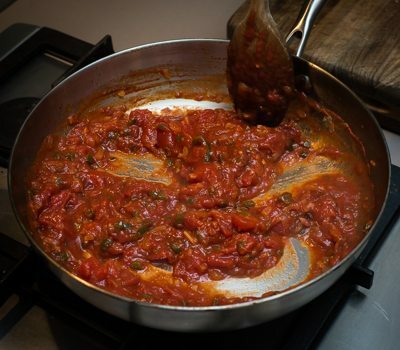 The critical starting point in this dish is the slow cooked mixture of garlic, onion, green capsicum and tomato, otherwise known as the ‘Sofrito’ in Spanish cooking, this forms the basis in many Spanish dishes most notably Paella. 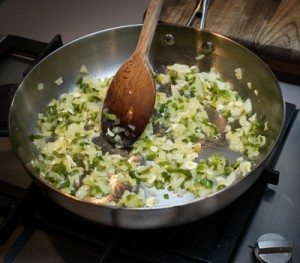 The gentle sautéing over low heat brings out the sweet caramelized flavours, I urge you to resist rushing this part, instead make a cup of tea and relax over the Sunday papers or a good book while it gently cooks. It was the wonderful Moro cookbook by Sam & Sam Clarke of Moro fame that introduced me to the ‘Sofrito’ concept when exploring Paella recipes.